It was recently a constituent work period, so I was able to spend the last two weeks traveling across the district and meeting with friends, neighbors, and different groups. 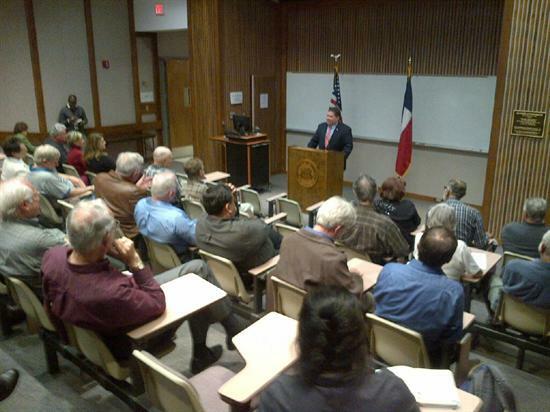 I also held two town hall meetings, one in Victoria, and the other in Wharton. To be a Representative you need to talk with the people you represent. That’s why I host these conversational meetings. In Wharton, we discussed ways to make Medicare viable for the future, while at the same time preserving it for those who are retired already or who will be retiring soon. In Victoria, there was discussion about the jobs that the oil and gas industry has created, as well as the potential for growth of new industries and job opportunities associated with exports of liquefied natural gas (LNG). I also answered questions about sequestration, the budget, education, comprehensive immigration reform, and more. Video from the town hall meeting in Victoria is below.